COMMANDING OFFICERS Lt. Baley and Capts. Patricia Sandoval and Tony Oddo. Wilshire Division Capt. 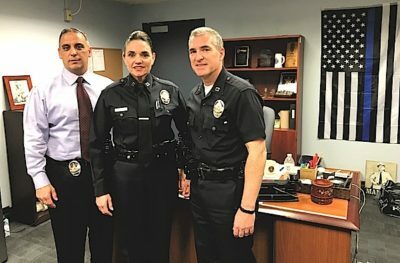 Anthony Oddo is impressed with the mostly positive attitude he has found among the officers of the LAPD Wilshire Division and the residents who live here. “I love it,” he said in his new office and command center on Venice Blvd. Capt. Oddo comes to Wilshire from a command post at the city jail. “Coming from a jail environment, that’s the biggest change. There’s not a lot of happy inmates,” he noted. The bulk of his 31-year career has been in South Central, where “the environment is different, but people are people,” he added. He assumed his new post in the different environment, that includes the Grove and Beverly Center, on Christmas Eve. He works with a leadership team: Capt. Patricia Sandoval, who heads the division’s 230-officer patrol, and Lt. Charles Baley, who heads the division’s 30 detectives. Baley came on board at Wilshire Division in November. “We make the decisions,” Oddo said of his three-member team. After high school, Capt. Oddo spent a six-year tour of duty as a rifleman with the U.S. Marine Corps Reserve, and he graduated from Cal State Fullerton with a bachelor of arts in finance. Police Dept. in 1986 and joined the LAPD in 1989. As an officer, Oddo was assigned to Newton St. and Southeast areas, where he worked assignments in patrol, CRASH, and the Special Enforcement Group. In 1998, Oddo was promoted to sergeant with assignments in the Hollywood and Southeast areas. In 2008, he was promoted to lieutenant and assigned to the 77th St. area as a watch commander. In 2012, Oddo graduated from the FBI National Academy. Since promoting to captain in 2013, Oddo has had assignments in Olympic and Northeast patrols and was the commanding officer of Custody Services Division, aka the city jail. Wilshire’s 11.73-square mile division serves approximately 200,000 people who reside between the Santa Monica Freeway and Santa Monica Blvd. The division includes the Miracle Mile, and the western half of the Greater Wilshire Neighborhood Council area, including Larchmont Blvd.